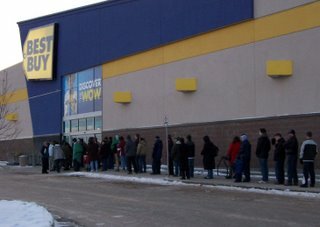 It's not a line of Boxing Day proportions, but this was the scene at Regina's Best Buy this morning as people lined up it hopes of getting their share of a small shipment of Wii and PS3 gaming consoles. Inside one of the employees seemed delighted to tell latecomers they were out of luck. 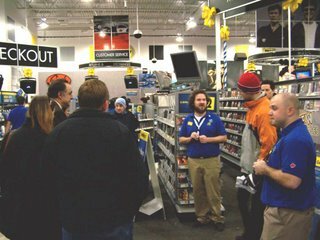 Is that Peter Jackson on his second job? That is hilarious. I know that guy! Ha ha ha.